It's doubtful that the new Disney animated comedy Zootopia will bring the same fevered devotion and love as fans have for the studio's 2013 blockbuster Frozen. But that doesn't mean the animators can't have a little fun. They've decided to hide a cool Frozen Easter egg away in this animal-lovers paradise. And we have a new image that shows off this cool treat in all it's glory. Disney has a long and storied history when it comes to scattering Easter eggs throughout any of their animated movies. And it appears that Zootopia is ready to give Frozen a big shout out. And no, we're not talking about the fact that Kristen Bell, who voices Anna in Frozen, also returns to voice a three-toed sloth in this latest animated adventure. 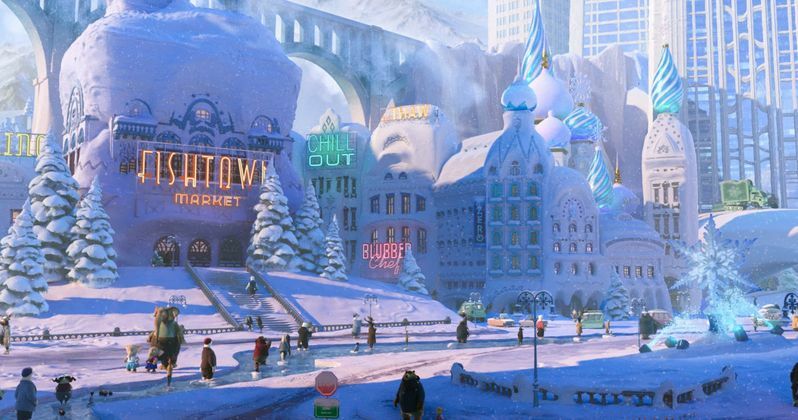 A new image shows off the icy district of Tundratown, one of the many burgs in the animal kingdom of Zootopia. If you look closely, you'll spot an elephant family taking a brisk stroll through the city. Upon closer inspection, you'll notice that the two pachyderm children in the lower left-hand corner are actually wearing the same costumes worn by Elsa and Ann in Frozen! Zootopia is directed by Byron Howard (Tangled, Bolt) and Rich Moore (Wreck-It Ralph, The Simpsons), and co-directed by Jared Bush (Penn Zero: Part-Time Hero). The screenplay was written by Jared Bush and Phil Johnston (The Brothers Grimsby), with Clark Spencer (Wreck-It Ralph, Lilo & Stitch) serving as producer. Take a look at this latest image from Zootopia. Do you see the two Elephants dressed as Anna and Elsa?